This question may confuse many among you quite a lot. The particle has a negative charge and that too may enhance your doubts. Think of the moving charge as a moving current element. Since the charge is negative and is moving along the positive y-direction, the direction of the conventional current is along the negative y-direction. At the circular loop this current element gives rise to a magnetic field perpendicular to the plane of the loop, directed towards the reader. When the charged particle is at A, the magnetic flux through the loop is small and when it is nearest to the circular loop (at O), the magnetic flux through the loop is maximum. The increasing magnetic flux induces a current in the loop. By Lenz’s law the induced current must flow in the clockwise sense (so that the magnetic flux produced by the induced current opposes the increasing magnetic flux produced by the moving charge). When the charge moves from O to B, the magnetic flux linked with the loop decreases. The current induced in the loop now changes its direction since the magnetic flux produced by the induced current has to oppose the decreasing magnetic flux produced by the moving charge. The correct option is (e). (e) The induced current flows in the clockwise sense and anticlockwise sense respectively when the charged particle traces the paths AO and OB]. (a) The induced current in the side PQ flows from P to Q. (b) The induced current in the side RS flows from S to R.
(c) There is no induced current in the loop since the voltage induced in the side PS as well as QR is zero. (d) There is no induced current in the loop since no voltage is induced in any of the sides of the loop. (e) There is no induced current in the loop since the voltages induced in the sides PS and QR are equal and they act in opposition in the loop. No current is induced in the loop since the magnetic flux linked with the loop is the same in all positions of the loop. So there is no change of flux to produce an induced emf in the loop. Even though the last three options indicate that the induced current in the loop is zero, the reason for this is correct in the case of option (e) only. Equal motional emfs are generated in the sides PS and QR and these act in the loop as two voltage sources in opposition. (a) The electric potential at the centre of the rod is maximum when the rod moves. 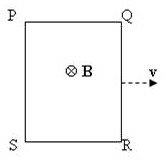 (b) The electric potential at the centre of the rod is minimum when the rod moves. (c) The electric potential is the same at all points of the rod when it moves. (d) An electric field is produced in the rod when it moves. When the rod moves at right angles to the magnetic field, the free electrons in the rod experience magnetic (Lorentz) force and shift towards one end. Thus there is an accumulation of negative charges at one end of the rod and consequently there exists an electric field in the rod [Option (d)]. (a) 4 H and 6 Ω. Adding Eq(i) and Eq(ii) we have 12 R = 18 from which R = 1.5 Ω. On substituting the value of R in Eq(ii) we obtain L = 0.3 H [Option (d)].